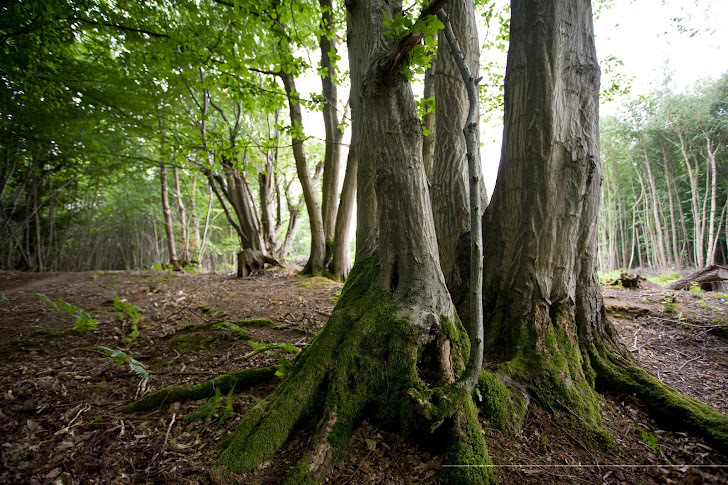 Welcome to the Blog of Cutler´s Wood, an Ancient Semi-Natural Woodland in the Kent North Downs AONB (Area of Outstanding Natural Beauty). Cutler´s is 42 hectares (ca. 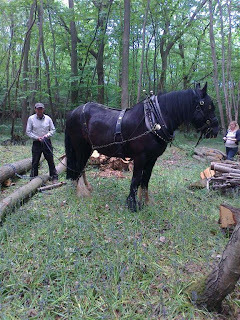 103 acres) of native broadleaf woodland managed primarily as wildlife and flora habitat but also to provide some timber from coppice rotation which is used for traditional fencing and woodfuel. Adjacent to Cutler´s Wood is Cutler´s Farm, made up of the farmyard with barns and 6 hectares (ca. 15 acres) of pasture land, which presently is used for sheep grazing. Bordering onto the Forestry Commission´s Kings Wood to the south west, privately owned Stanner´s Wood to the north west, The Woodland Trust´s Park Wood to the north and the privately owned Ridge Wood and Felborough Wood to the east, this area makes up over 2000 acres of connected woodland and one of the largest woodlands in the South East of England. This whole area was once part of a royal hunting forest for deer and boar. 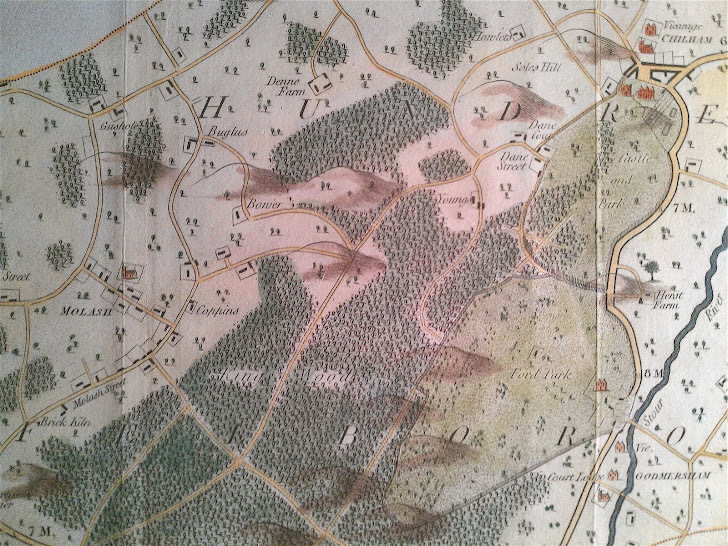 Edward Hasted´s map of Cutler´s area published 1798 but showing the area apparently around 1778. Cutler´s Farm seems not to have existed yet. Look, there are some deer ! Deer are very common in and around Cutler's but to many people they are just deer, almost as if there were only one type of deer in the UK. Actually, there are six different types of deer in the UK. The indigenous red and roe deer, the fallow deer and the most recent introductions of sika, muntjac and chinese water deer. All the wild deer around Cutler's are fallow deer. Fallow are really a semi-indigenous species in the UK, they were around during Norman times and may even have been brought by the Romans. Fallow were probably indigenous before the ice ages but migrated to southern Europe as the weather became colder and only came back with the Romans or Normans. Roe and red deer became extinct in much of Britain due to overhunting and were gone from our area of Kent by 1700. Fallow on the other hand, being a herd animal, were kept in parks and estates (from which many escaped) for hunting and show and this is what most definitely saved them also becoming extinct. Even though they are all called deer, roe, red and fallow have some quite significant differences and roe deer in particular are quite far removed from both of the other types, being more closely related to the elk of northern Europe than to red or fallow deer. Red deer are the largest deer followed by fallow and roe deer are considerably smaller. Both red and fallow deer tend to live in herds or groups depending on the time of year, whereas roe deer tend to live alone or in small family groups. The roe bucks are extremely territorial and can be very aggressive when protecting their territory. Fallow bucks are easily identified by the flattened forked surfaces of their antlers. Both red stags and roe bucks have round forked antlers. Deer loose their antlers every year after which they immediately begin to grow a new pair. This is opposed to bovine animals (horned) animals which keep the same horns, which continue growing, for life. The age of horned animals can be told by counting the growth rings on their horns much like growth rings of a tree. Fallow bucks loose their antlers around April, after which the new antlers begin to grow. During the growth period the antlers are covered with a velvety skin. After the growth period the skin dies off and the bucks will rub the skin off on smaller trees and bushes, which causes quite some damage to the bark. The antlers of older bucks will have finished growing by September i.e. a set of antlers will grow from nothing in around five months ! The fallow rutting season starts in October and goes into November. The bucks will turn up at the rutting places and can be heard over quite long distances by their grunting. One interesting fact of the fallow rut is that it is the does who choose the buck and not vice versa as with red deer. Girl power ! Fawns are born after 7.5 months in June or July, mostly a single fawn but sometimes twins. As new born fawns are often not able to follow their mother, the mother will leave them hidden in undergrowth while she feeds. People coming across a young fawn often think it to have lost its mother. Leave it alone ! The mother is probably not far away and will return. Fallow deer are not as selective as roe deer as to their feeding and can cope with much rougher food than roe deer. Fallow feed on grasses, herbs, leaves, buds, fungi, bark, chestnuts, acorns and all manner of farm crops and fruit which makes it an arch enemy of most farmers. Fallow can also see much better than roe deer and can also detect non-moving subjects which roe often can't. If you come across roe deer and immediately stand still the chances are the roe will not see you and will ignore you if you are downwind of him. In the same circumstances a fallow will usually be long gone. Roe bucks loose their antlers between October and December after which their new antlers grow until around May / June. The rut then takes place in August. Now something amazing happens; after fertilization embryonic development is delayed for four months until December after which foetal growth starts and kits are born in May or June. It is this dormant state of embryonic development that has enabled roe deer to survive without the danger of their kits being born in the depths of winter. Roe deer, although hunted to extinction in many parts of the UK have steadily been recolonizing the country for some time. They are present in western Kent but the channel tunnel high speed rail link and the M20 are barriers to migration. The M/A2 also presents a barrier to recolonization. However, in 2011 roe deer were first sighted living around the Faversham area which is only 8 miles from Cutler's and the British Deer Society is of the opinion that within ten years, roe deer will have successfully recolonizied all of Kent. It will be a great day when roe deer, and later perhaps red deer, eventually recolonize the area. Looking at the last post I see that has been over a year since I last wrote anything. Last September we took part in the Weald Wood Fair which was interesting, even if it didn't earn any money after costs were taken into account. There was certainly a fantastic atmosphere at the show and the live music on Saturday night was great. I think that this fair is an excellent opportunity for everybody who has anything to do with woods or timber to come together once a year. I did buy two oak huts there which were built at Plumpton College in Flimwell during oak frame building courses by students. These were transported to Cutler's and erected by the very capable people at Sussex Oak Frame Builders. These huts have been put up in the woods to act as shelters and hides for watching wildlife. 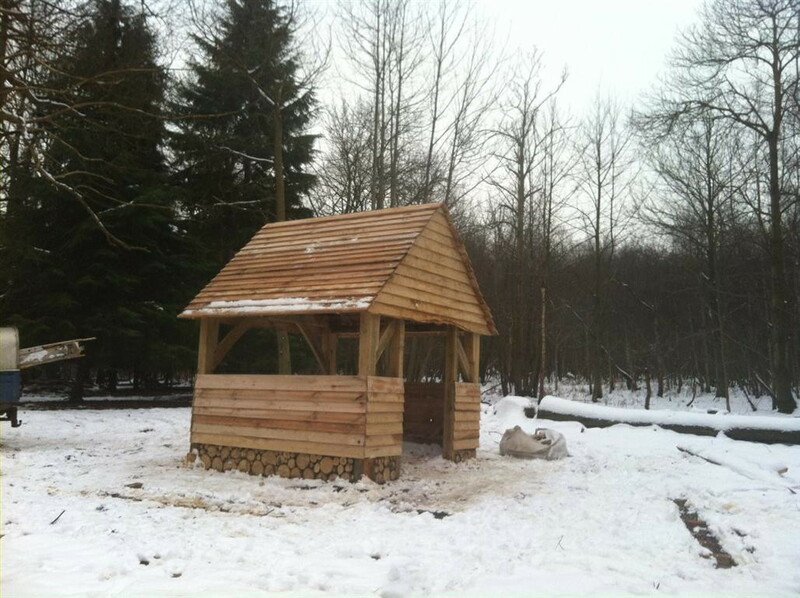 Martin and John have been busy in December and January felling some sweet chestnut and then saw milling it to clad the roof and sides of the huts. The result can be seen in the pictures and I think is very good. 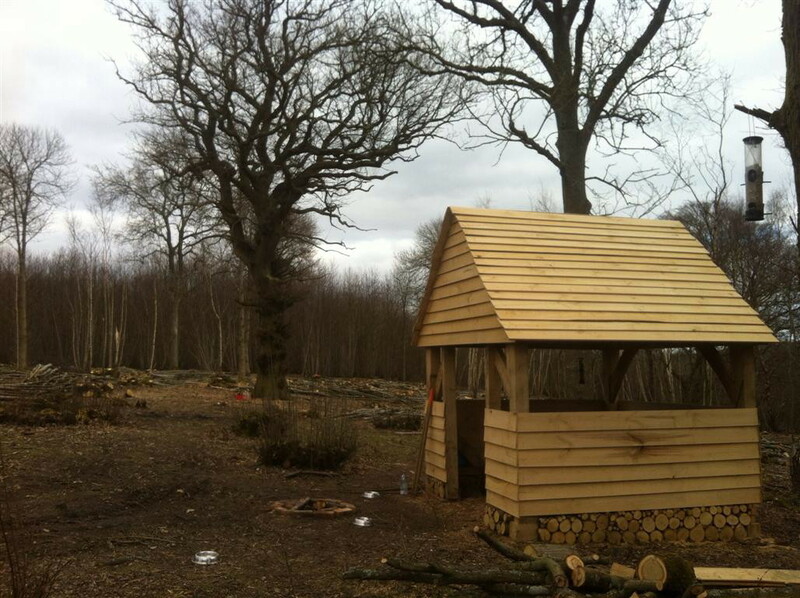 Being made of oak and chestnut, these huts will probably be around long after we have gone. It was in November that we had visitors of the not welcome kind at the farmyard. Martin had bogged his Land Rover down at a neighbouring farm one evening. Normally the Land Rover was used to block in our timber trailer in the barn and would be chained together with the trailer. The next morning the trailer was gone. The thieves had come through King's Wood and cut a hole in the fence at the end of our field and got the trailer out, even though the timber grab was hung on a large log. It is obvious that the thieves are locals who know the area very well and had been watching our farmyard for some time. These people are the scourge of the British countryside but unfortunately the police seem powerless to do anything at all. 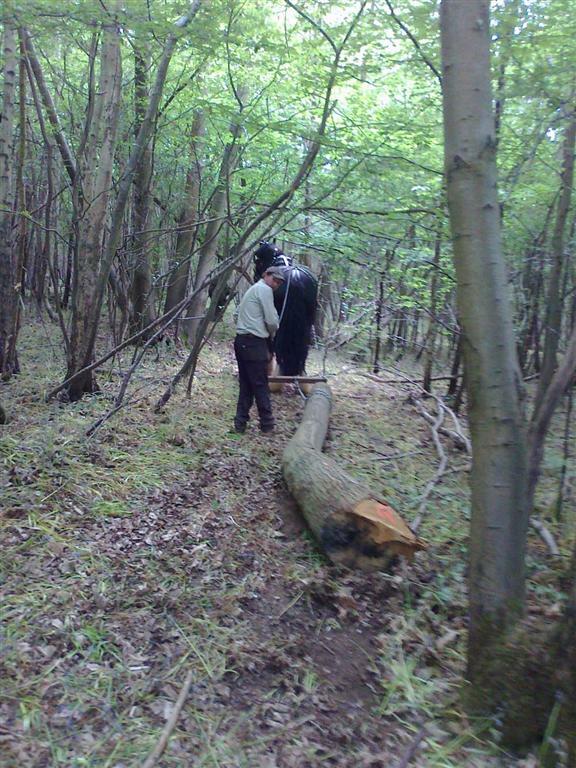 In our case the police took down details but made no effort to try follow any tracks through King's Wood. Woodcock have been quite prevalent this winter, there are certainly more than last winter. We believe these birds to be migrants from Russia and Eastern Europe. We have been coppicing another two acres this winter and things are developing nicely. It is amazing how previously dormant seeds suddenly germinate once light gets onto previously shaded out areas. An area we cut two years ago for example was full of foxgloves last spring for the first time in decades. Back in Spring 2011 I asked local woodsman and horse logger, John Mancini, to extract some larger sweet chestnut stems from an area of Cutler´s difficult to access with a tractor. 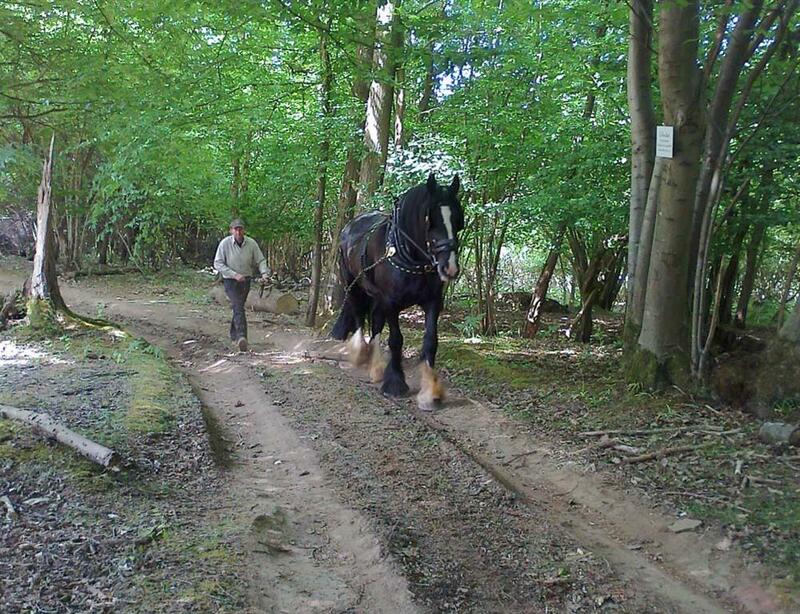 John used his horse Bob for the extraction work and these are some pictures of Bob at work. 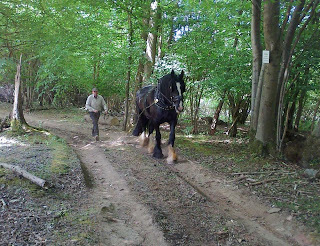 There is something special seeing horses at work and there are the added advantages of less soil compaction and the horses ability to work in tight areas where the use of a tractor would cause considerable ground damage. They are also surprisingly quick. Due to the actions of a few ignorant people, leaving their dogs roam freely through the woods and disturbing wildlife, people who have, upon being asked to keep their dogs on a lead or leave, then felt it neccessary to be abusive towards me, I have decided with immediate effect to close Cutler's Wood completely to the public. 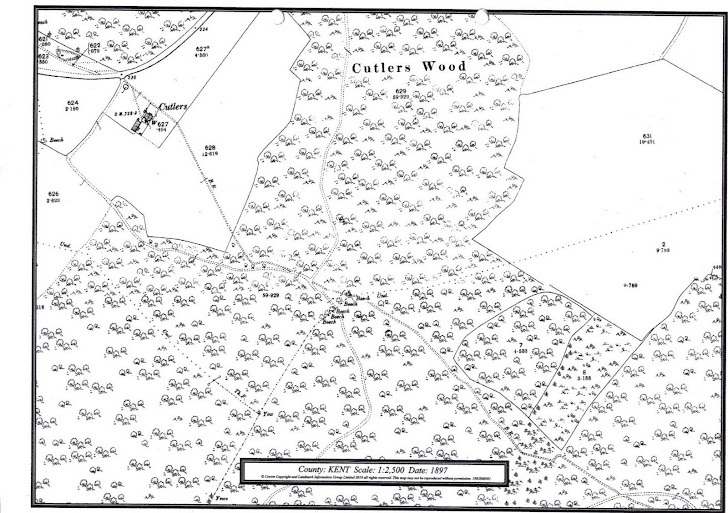 There are NO PUBLIC RIGHTS OF WAY through Cutler's Wood. In future anybody found trespassing in Cutler's Wood without authority from myself will be asked to leave. Due force will be used against those who refuse to comply. It is unfortunate that I have been forced into this decision but it seems that in this day and age, more and more people seem to be of the opinion that they can do what they like, wherever they like. Poachers, vandals, litterers or fly tippers will not be tolerated and will be prosecuted. Any unauthorized weapons will be confiscated and immediately destroyed. There have been recent incidents of poaching, where deer have been shot and wounded by poachers, even using inappropriate weapons such as shotguns and crossbows. These people show a total disregard for nature and need to be brought before the courts. For any information leading to the positive identification of poachers, vandals, litterers or fly tippers, we will pay a reward of 200.- Pounds. 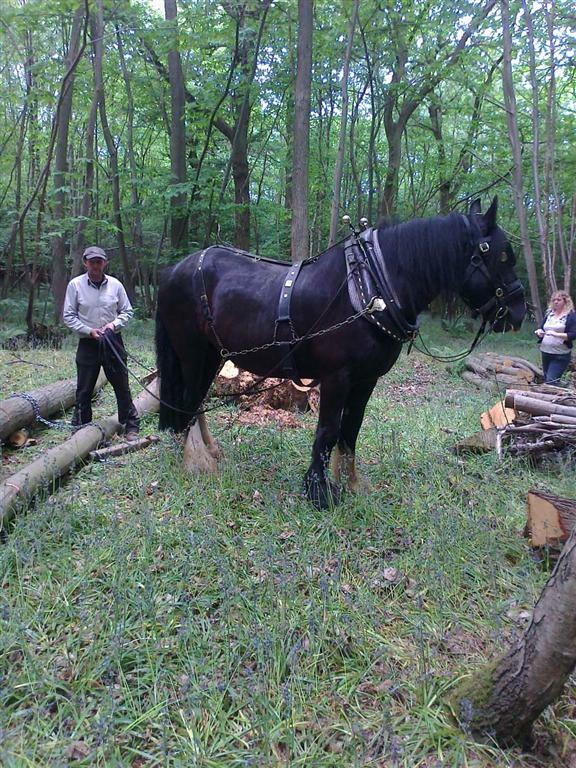 For details of sales of hardwood logs from Cutler´s Wood please click on the "Ecologically Sustainable Logs from Cutler´s Wood" page button below. In Autumn of 1987 The Great Storm swept over large areas of the UK and Europe leaving devastation in its wake. The above pages document the aftermath of that ill fated day as it effected Cutler´s Wood. These pages were written by Ralf Reed, the then owner of Cutler´s and are witness to the huge amount of work and dedication involved in clearing up afterwards. Cutler´s is home to a large array of wildlife including (but not only) foxes, badgers, squirrels, fallow deer, wiesels, stoats, dormice, adders, grass snakes, frogs and toads and the odd wild boar as well as the almost the entire range of woodland birdlife (including migratory species such as woodcock, this area being first landfall on their way south from Scandinavia). The fallow deer are very often black in colour and often lack the light coloured spots found on fallow deer elswhere. There are also a number of "white" fallow deer in the woods, these are not albinos but are just a very light colour. In the absence of natural predators it is neccessary to control numbers of some of the above species such as grey squirrels and deer, both of which can do great harm to tree regeneration. Cutler´s is a very diverse woodland with many types of broadleaf trees such as sweet chestnut, oak, beech, ash, hornbeam, wild cherry, black walnut, hazel, sycamore, norway maple, field maple and birch. There are small patches of conifers such a western hemlock, western red cedar and even a few redwoods. 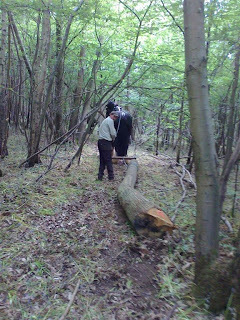 The chestnut has historically been coppiced on a rotation of around 15 years although, after the collapse of the coppice market during the second half of the last century, a trial was started by the previous owner of the woodland to "store" one good stem of chestnut and cut back other shoots with the aim of producing chestnut standards of higher quality. After the hurricane of 1987 much replanting took place and black walnut was amongst the species planted at that time. This would, with todays understanding of potential climate change, seem to have been a move in the right direction as species more tolerant of warmer and dryer weather may become more important to future generations, as native species such as birch and ash may retreat northwards. Ancient boundary trees mark the borders of the wood. Mostly yew, hornbeam and beech many of these have attained great size whilst others are partly moribund. Chalk is found not far below the surface and tree growth depends to a great extent upon tolerance to this free draining chalk environment. On my way back I met Black, the woodman, walking home to his cottage. His family had been woodmen on the estate for four hundred years. He had no son of his own, which seemed a tragedy, for it meant the dying out of all that lore. He could tell the age of a tree at a glance: and fell it within an inch of an intended mark. He was a bit of a rascal: an old cavalryman, like myself. But that was the bond between us. 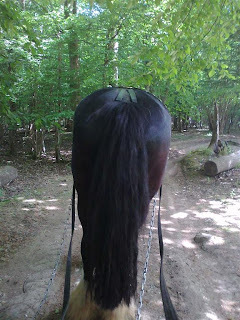 He patted Oletha´s head absentmindedly and held her bridle automatically, while he talked about the felling of some mature oak in Cutler´s Wood, a mile and a half away. Black was no more enthusiastic about felling trees than I was; but we would ride through the woods carefully - at least I would ride while he walked and mark them selectively, so as not to disturb the amentities. He recognized that the estate needed the money in these times. Spinner, on the other hand, was a bright young man, not more than thirty, with very blond hair, but expert at his job, as the joiner and carpenter. He wore a pair of blue overalls and carried a folding brass-hinged and brass tipped ruler. Black, the woodman wore an old tweed jacket, out at the elbows, and held a cloth cap in his hand. His large square head, with his sparse grey hairs and ruddy face, looked surprised. "It is about the old mill," Spinner began. "I´ve had a look at the main supporting beams, as you asked , Sir, and one of them is rotted nearly through. The other can be cleaned up and supported. But they´re very long. Black and I have just measured them: twenty-eight feet." "Have we got one on the estate that will do?" I turned to Black. "I know you´re keen to have a beam out of Chilham oak," Black said , uneasily, looking away through the windows which overlooked the courtyard, with a glimpse of the park beyond. "But it takes a very straight tree to get a clear beam the size young Spinner wants." "It will have to be eighteen inches square before roughing at least," Spinner put it. "Well, Black, out with it. You know every tree on the place. You know just the tree and don´t want to fell it. Is that it?" Black looked more uncomfortable than ever. "They´re your trees , of course, Sir. But the way I look at it is this. The value will always be in oak. It´s not like beech, which reaches maturity in a hundred years or so, and begins to go back. There are trees in the heronry avenue which could come down now; if it wasn´t for the look of them. 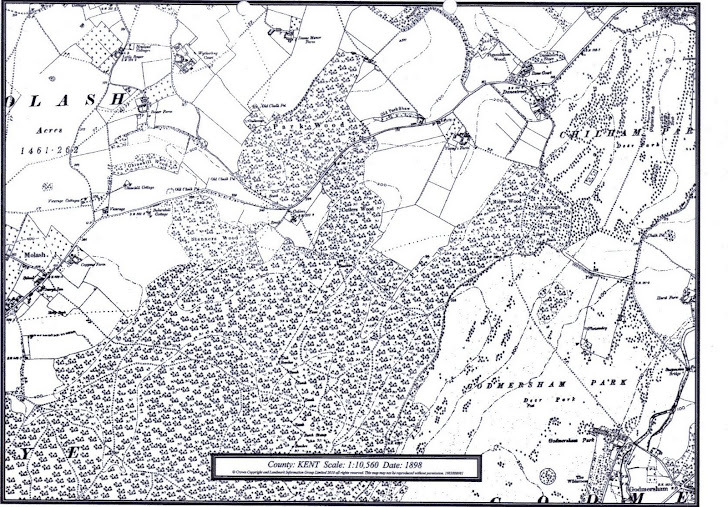 But the oaks in Cutler´s Wood will stand another two hundred years if you like. And you could order a baulk of timber from the merchants, just as good, exactly the dimensions Spinner needs. Do you really need to fell one of the Chilham oaks? It will take such a good one for this job." "In Cutler´s Wood. You may not have noticed it, because the underwood there is pretty high: about seven years´growth. It´s one of the group on the rise overlooking old Cutler´s Farm." I said we would go and see it. Petrol rationing was still in force at this time just after the war, but I had discovered from Bullock, who was an engineer, from whom I was buying a yacht, that a car would run almost equally well on paraffin if it was first heated up, so a day or two later, I went in search of Spinner. I found him in the workshops, where the long saw benches for the cutting of great baulks of timber of byegone days, were still serviceable. Spinner and Black were, in fact, guiding the enormous trunk of the oak tree felled in Cutler´s Wood for the mill beam, on to the long metal surfaced bench. 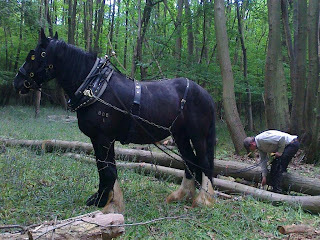 A timber haulier had been engaged to drag it down, crushing in its wake a million bluebells and primroses, and transported it to the workshops. These were at the bottom of the hill, near the village hall: and housed also the deep well pumps which supplied the castle. These were run on paraffin and it was in search of this fluid that I wanted to see Spinner. "Ah, there she is," I exclaimed as soon as I saw the enormous tree trunk, "How large it looks in here." "They always do," said Black mournfully. Its base was sawn through, laboriously by cross-cut saws, wielded by Black and an unwilling Jeans: till the cut reached the bite taken out of it first by Black with an axe on the side where the tree was to fall. What a crash that had been, tearing through the branches of the smaller trees. The chestnut underwood around its base had first been cut by Black over a radius of forty yards. The giant had fallen with a roar and shuddered on the ground, leaving a groove, a yard wide, long visible. Now it lay like the trunk of Gulliver´s body, while the mortals climbed about it on the long benches. They were chaining it about with chains, and levering it with iron crowbars, to bring it into line with the hungry fanged saw: whose sharp teeth gleamed in the half dark of the saw sheds. Spinner had filed each tooth with his files, till they had a metallic glint. The surfaces of the saw were greased so that it could cut swiftly and smoothly into the flesh of the tree, first flaying off its bark, with long steady cuts, right along its length. The upper branches, where they forked away from the main stem, had been cut off and left to later dissection on the ground. "Spinner," I said, "I want some paraffin. I have been told by one called Bullock, a resouceful man and an engineer, that once a car is warmed up and running, if you fill the tank with paraffin, it will go on running, so long as you don´t stop. Anyway, I intend to try!" "Not in the Rolls, surely?" "Yes. It can´t do it much harm once in a while. I want to get down to the yacht, which has arrived at Southampton, or thereabouts. It´s a journey of 150 miles. So I propose to start the car on a gallon of petrol before I leave tomorrow, and come down to you here about 3 o´clock, where you will be ready with funnels and drums to pour in fifteen gallons of paraffin. Have you got it?" "Oh, yes. We have got fifty gallons at a time for the pumps and the sawmill: the tanks have only just been filled." Black was leaning against the ancient bark of the oak, and looking thoughtfully out of his pale blue eyes. Perhaps he was just staring into space and thinking of beer - it was a preoccupation of his, and many a time could he be seen, sloping his old cavalry shoulders through the darkened doorway of the village pub. His eye remained undimmed and his hand never faltered with the axe. "Now let us see what you are going to do with the tree." "Is she in position?" Spinner asked Black, who walked out into the sunlight and lined up the trunk with an aiming mark beyond the saw. "She´s true. Let her spin."